In this tutorial we will be making a beautiful 8-petal flower. Each petal in this flower made on a base of a big chain space. To start the petal make single crochet stitches into the chain spaces and around the treble crochet post. Then continue work in rows until you complete the petal. Decorate the flower with a bead. Wish You all the best! 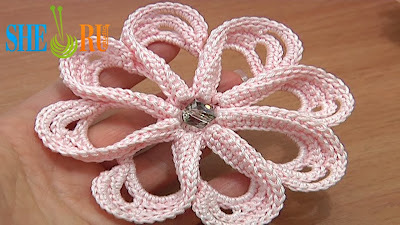 To make this crochet flower use yarn 100% Cotton mercerized, 169m/50g; and Steel Crochet Hook 1.5 mm or 2mm (#8 or #4 US standards).